My camera (Sony A7RII) offers image stabilisation (SteadyShoot). I shoot macros using a 50mm and a 28mm Olympus lens reverse mounted with anadapter. What values should I enter in the menu to configure SteadyShoot (8mm-1000mm)? Is there a formula? If so can this include the additional use of extension tubes (I currently use 16mm + 10mm). 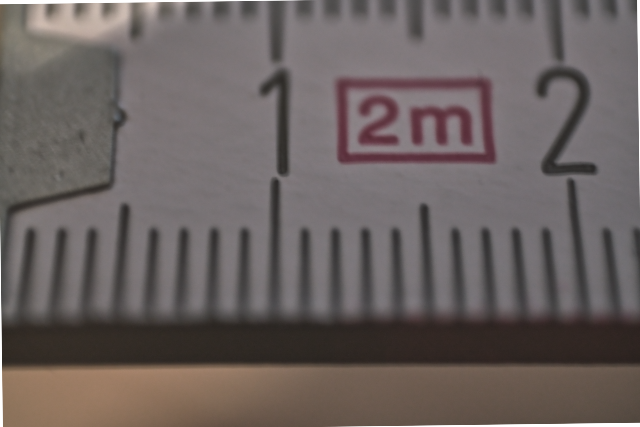 The lens normal mounted is able to reproduce 370mm on a 36mm sensor this should be a magnification of 0.097:1 roughly a tenth. With the extension tubes (26mm) 22mm on 36mm gives 1.64:1 magnification. 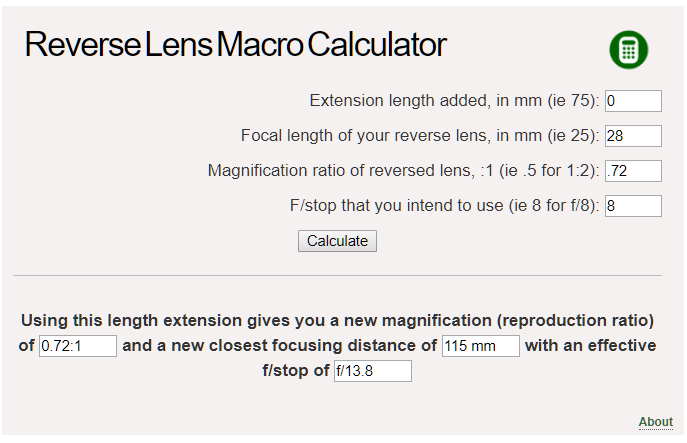 Adding the extension tubes (26mm) shows the measured maginification (1.64:1) and the focal length of 119mm. So the best setting would be 115mm without extension tubes and 120mm with extension tubes. Stacking lenses is no different in principle than stacking close-up adapter (also sometimes called close-up "filters" because they screw on to a lens's filter threads, and look much like a regular filter). Close-up adapters are usually described by their diopter — their optical power, which is just the reciprocal of the lens's focal length (in meters). Thus a 5 diopter lens has a focal length of 1/5 = 0.2 m = 200 mm. 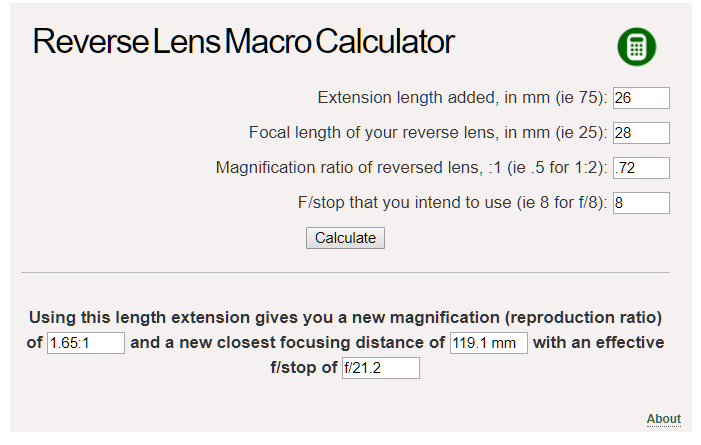 In your case, the equivalent focal length is 1/(1/0.050 + 1/0.028) = ~18 mm. Not the answer you're looking for? Browse other questions tagged macro focal-length image-stabilization calculations or ask your own question. Does using a lens adapter change focal length? Does the lens mount matter when reverse mounting for macro? How to calculate the focal length for old lenses (m42 or m39) mounted on Sony Nex? How can I tell what focal length a zoom lens was set to for a photo of the moon?